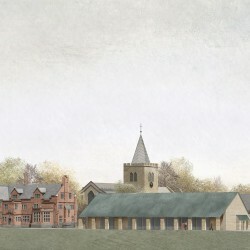 Caruso St John have won the competition to restore and expand Gladstone’s Library in Hawarden, North Wales. The institution, founded by William Gladstone in 1889, is the UK’s only Prime Ministerial Library. 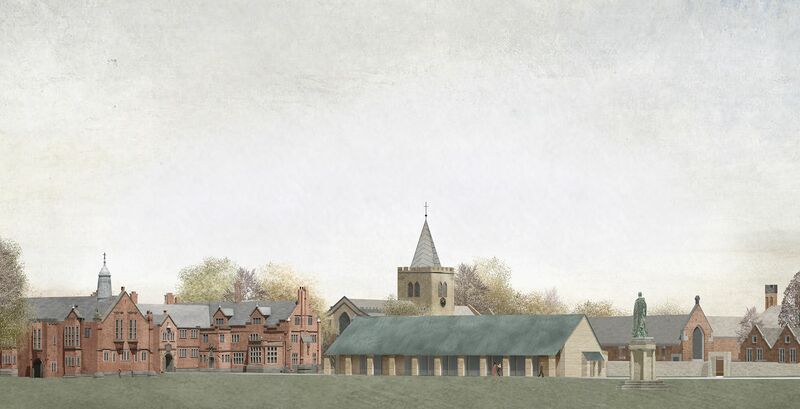 The project aims to promote wider engagement with the liberal values that lay at the heart of Gladstone’s life and work and involves the creation of a new building adjacent to the Grade I listed library as well as work to historic interiors and the surrounding landscape. The peaceful atmosphere of Gladstone’s Library is a precious quality for a publicly-accessible building, and this is the first thing that comes to mind when one is making plans for an expansion that will bring a greater number of people to this beautiful place. The library, with its delicate stone architecture and lawns, its special library room, and small rooms for private study and to stay, is very like an Oxford college. 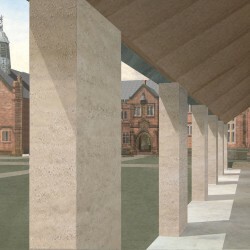 But in keeping with Gladstone’s values, this serious atmosphere of study is tempered by the open arrangement of the site and the buildings. 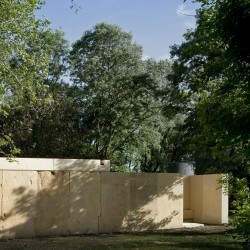 The building makes a world in which there is privacy for the imagination within the setting of a shared garden. There is a wonderful sense that anyone can walk across the carefully manicured grass , come in and read its books. 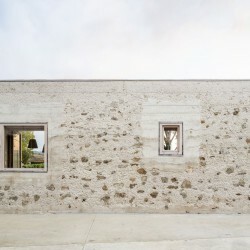 The calm atmosphere of the library comes first from its setting of gardens within a rural landscape. All the library’s rooms and corridors have a lot of daylight and views of trees. The first idea of this proposal is that the new building is placed to face towards the central lawn, alongside the front of the library. The two buildings placed together reinforce the feeling that the life of the library takes place around the gardens. 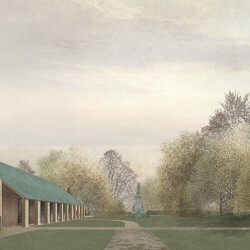 With the new plan, residents and visitors walk outside from the library to the new building around the central lawn, encouraging the kind of semi-outdoor life that you might find in a grouping of farm buildings or a monastery. The grounds of the library have a central long axis that extends south from the main building to Gladstone’s statue and the road. 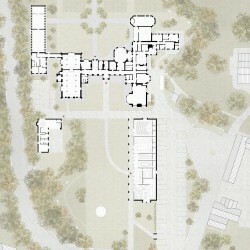 In this proposal, the new building has been placed along the east side of the front garden axis, making an edge to the main lawn and facing	west across the lawn towards the Reading Room. 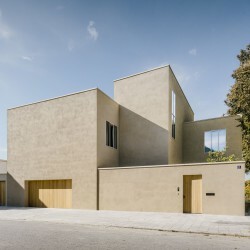 The low front of its pitched roof is designed to bring the scale of the building down to the level of the lawn. 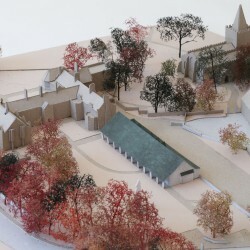 The simple pitched roof form is intended to stand together with the library and the church as part of a small settlement of buildings and gardens on the edge of the village. The proposal places both the visitor parking and the new building on the east side of the site. Placing them there allows visitors to arrive by car, walk to the new building and then on to the library, all in a natural sequence. The new parking plan provides 50 visitor parking spaces off Church Lane. 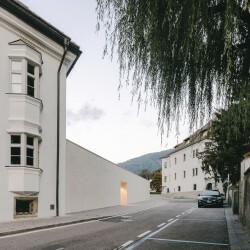 The parking is arranged in a long yard, enclosed by the existing stone wall along Church Lane and a new wall along the line of the rear of the new building. 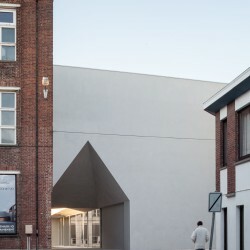 The enclosing walls ensure that the cars are screened from view from the village and the library gardens. A further 10 parking spaces for library staff are provided in a discrete position on the west side, giving a total of 60 parking spaces at the site. The new building has several different functions. On the one hand, it contains conference and meeting rooms to expand the library’s capacity to host events and teaching programmes. And on the other hand, it contains the front of house facilities of reception, exhibition space, cafe and toilets that are needed to receive visitors to the site. The busy public-facing uses in the new building will allow the residential library to maintain its atmosphere of quiet scholarship. Despite the variety of these functions, the new building should have a clear architectural identity as the ‘New Hall’ to reflect its prominent location at the front of the site. 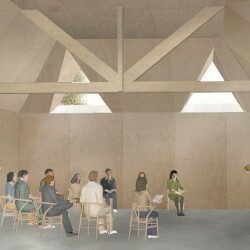 The design proposes a simple form for the new building with a high pitched roof like a barn or a village hall. Its spaces are arranged in a row, so as to give the plan a simple order. An arcade along its front acts as a place of arrival, to give covered access to all its rooms, and as a nice place for outdoor reading. 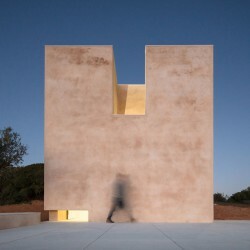 The New Hall with its arcaded face, acts as a kind of gatehouse to the whole site, the place where visitors arrive first, before continuing on to the library. 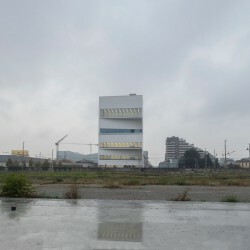 The new building has a simple plan of rooms, whose functions are to some extent interchangeable to allow flexibility and change. All the rooms are tall and have an aspect west onto the lawn, with the key spaces having light from above as well as through dormer windows on the east side. 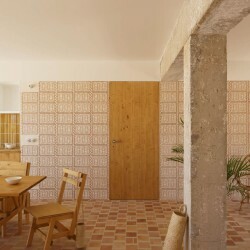 The building has a timber frame, whose repetitive structure gives an interesting expression to the interior architecture. The new cafe is located at the south end of the building, so that it has a further aspect south onto a sheltered outdoor space that is separate from the serenity of the front lawn.